As this article aims to educate the reader on a number of issues confronting Tibetans today, it is necessary to forewarn the reader that they might find some themes that are not directly related. I chose to include these issues because they are highly relevant to Tibetans and we ignore them at our own risk. Had CTA not disregarded an election bill it recently signed—nullifying the requirement of securing 33% of votes for parliamentary candidates to be declared the winner - Lukar Jam, a fierce independence advocate and political prisoner who escaped from Chinese Occupied Tibet - would be the winning candidate (his vote count trails next in line) for the parliament seat representing Dhomey province after Kirti Dolkar resigned. However, since the new bill failed to serve their political objective, that is to produce a new Middle Way parliamentarian, Tibetan Election Commission (TEC) with support from CTA unscrupulously strangled it under the pretext that the new election bill was meant to come into effect only after the current 15th Tibetan parliament concludes in 2016. TEC is conducting a fresh election in June to pave way of course for a candidate of their choice. The CTA’s attempts to get the final say from US consulates since 2009 on the issuance of visas to Tibetans is a top-down plot to control and eliminate aspirations of independence or any other form of opposition to its stance. (There are American officials who have taken note of this and are concerned). Those who are vocal about independence in particular and critical of CTA inactions in general will be denied visas to US on one pretext or the other. Thanks to the US consulate policy, for now. CTA has failed to get that authorization on visa issuance to poverty-stricken Tibetans in India, Nepal and Bhutan. The consulate policy on this might change in the future. If Sikyong Lobsang Sangay applies this unconstitutional control of the Tibetan thought, speech and movement; violence, bloodshed and assassinations as a payback among our community cannot be ruled out completely. Already in the past few years, there were cases of vandalism committed at the US embassy in Delhi by Tibetan men because their visa applications were rejected. For most Tibetans in exile, getting a visa to US is seen as a ticket out of grinding poverty in India, Nepal and Bhutan. Read Maura Moynihan’s article “Tibetans in India: the Case for Citizenship” on www.rangzen.net When it comes to real issues, CTA lags. The first clause of the article 78 of the exile charter on Tibetan local assembly states that there shall be a Tibetan local assembly in each of the respective Tibetan settlements. Byllakuppe, the biggest Tibetan settlement has no local assembly for years now. Does this ring a bell? There has been no committee or system to monitor how the Settlement Officers (SO) perform their duties. In other settlements, it is the local assembly that sees to it. With an amputated local democracy, the system of accountability especially with regard to the settlement office is considerably weakened. On regional committee of Tibetan Freedom Movement (TFM), the first clause of the article 60 of the exile charter categorically states that there shall be one such committee in all places where Tibetans-in-Exile reside. However, for some time in Byllakuppe, the TFM was shut down. This office also handles Greenbook matters. To clear the Greenbook dues, Bylakuppe Tibetans had to travel all the way to the Hunsur Tibetan settlement. Not only was this unnecessarily cumbersome for those Tibetans, but the revenue flow from the Greenbook slowed down. Only recently was the TFM election conducted, to the dismay of the local Tibetans, on provincial based voting system which can degenerate Tibetan local election system into unhealthy regional consciousness and eventually negative provincialism. The Sikyong speaks of unity, but it was he who pushed for this divisive tribalistic system of election of TFM executive members in Byllakuppe. In all other Tibetan settlements, the election system for the TFM executive members is non-provincial and non-sectarian based which is inclusive and politically healthy. At an interview with Tibetans at Wembley in 1999, His Holiness the Dalai Lama chastised his kinsmen for referring to themselves as ‘Gelugpas’ or ‘Kagyupas’, followers of the different sects within Tibetan Buddhism. Rather, he emphasized that they should see themselves as Tibetans and as Buddhists, focusing on similarities rather than their differences. This was a matter, he declared, that lay at the very heart of the continued existence of Tibetan culture. Our political focus and election practice too should go along this broad-minded perspective. For the past three decades, not one Settlement Officer in Byllakuppe has survived for more than a year in the office where the tenure is actually three years. Every Settlement Officer in Bylakuppee is transferred, long before their 3 year tenure is completed, to another settlement or post on one pretext or the other by the cabinet. For e.g. immediately after the last Settlement Officer Gonpo Tashi openly supported the need for secular local assembly and TFM; he was slapped with a transfer letter from the cabinet. Apparently, his well-meaning stance was seen as a threat to any agenda (vote bank politics?) the Sikyong and Home Minister Gyari Dolma might have. The parliament should not sit as a mute bystander. The less our parliament is populated with self-interested politicians who choose to look the other way the better it is. Settlement Officers quitting the office in old Bylakuppe settlement before their tenure is up is a highly negative trend that has continued for three decades straight. A glance at the Settlement Officer service chart told me all during my research trip there last summer. This rude awakening should jolt the parliamentarians in to finding out what regional yahoos were intimidating and pressuring the SOs to apply for transfer or leave their office prematurely. Parliament must take proper action at once. Obviously, the main regional yahoos in this instance are Sikyong Sangay and Home Minister Gyari Dolma. It is due to their support that the unhealthy provincial based election practice for Bylakuppe TFM continues. This must stop. Over the years, Bylakuppe Social Action Movement (SAM) executives, petitioned the CTA and met Home Minister, the Sikyong and others and the response was always “We are looking into the matter”. How much longer will it take before they act on this? Instead of praising the good social, cultural and educational work that SAM has been doing all these years, Gyari Dolma looked down on SAM with sarcasm as something insignificant. Unfortunately, she also used some provincially divisive language on an effort that sincerely aims to ensure a healthy TFM election system for the greater good of our community as a whole. For more information, visit www.socialactionmovement.org or contact samkyilpalden@yahoo.com. Several years ago, the CTA took back farming land in almost all the Tibetan settlements in India from those families whose members were either deceased or had migrated abroad and were redistributed to those who hadn't got their share of land. This was certainly a well-intended fair practice. However, CTA has not applied this same rule to Bylakuppe settlement. The question is why this double standard. This year in Minnesota, Speaker Penpa Tsering vowed he would not even consider Tibetan people’s petition with just names, signatures, dates, addresses, contact emails and phone numbers. For any petition to be taken seriously, every individual must write a long letter himself or herself. Now obviously this is not possible with most Tibetans due to lack of education or time. As the reader can see through, the objective here is to silence our public voice by appearing to be reasonable on such flimsy ground. The Phayul Message Forum where thousands of Tibetans voice their opposition to MWA or inactions of CTA, has been shut down due to pressure from the CTA. The CTA prides itself as being the avenue for the free expression of voices for Tibetan freedom. Shutting down the forum is hardly consistent with that mission. It is suppressive and censorious. Speaker Penpa Tsering’s accusation that independence advocates always target CTA, not CCP is an outright lie. It is a clumsy preemptive strike to shut independence advocates up so they can go business as usual. For instance, Jamyang Norbu (who is considered the foremost 21st century Tibetan intellectual) has written a number of well-researched articles and books targeting CCP and its running dogs. If the CTA has the sincere desire for reform and progress then it should understand the benefit of objective and constructive criticism. The CTA should open up to new suggestions and ideas and so occasionally invite Jamyang Norbu and others to speak at the parliament or the CTA hall. There is nothing personal here, not even little. The Dalai Lama’s constant recitation of Middle Way mantra during his travels in the Tibetan diaspora is turning the cabinet and the parliament into his puppets on core political issues. As soon as the Dalai Lama expressed disappointment with those six Tibetan intellectuals and independence activists, the last September parliament session degenerated into emotional blackmailing, blacklisting, and witch-hunting. Samdhong Lama’s “follow the Dalai Lama” speech simply reinforced blind loyalties. Like the retired President Bush, he should stay away from politics. Have you ever wondered if the Sikyong can ask for a review of the current approach, constitutionally he can but can he in practice? If he does, he won’t survive as Sikyong for more than a week. Pressure can come from any quarters and that is absolutely fine as long as it is democratic. The problem is when it comes from institutions like the Dalai Lama that has claimed to have retired politically. The CTA does have quite a free run on non political issues like educational prize or health policy but that’s the extent they can go. The Dalai Lama, although very well meaning, has nevertheless unwittingly proved the best spokesperson for the CCP over the past four decades. May he now start to stay neutral politically! After all that’s exactly what devolution of power is all about. He should refrain from using "individual rights and responsibility" as a pretext to interfere and shove his failed four decade old MWA down the public throat. The Dalai Lama may devote all his retirement time to spirituality, universal love and harmony of world religions. When he truly does this, the Chinese accusation that the Dalai Lama is the Grand Ayatollah (a spiritual figure exercising political power behind the curtain) of the Tibetan political world will be put to rest once and for all. Tibetan people shall lose faith in CTA if our highest offices are excused from scrutiny. Sikyong should be setting the example of transparency. The Dalai Lama rightly said that a lack of transparency results in distrust and a deep sense of insecurity. On the matter of the Sikyong’s mortgage payment issue, the question is not how but who paid off 90% of his house loan just before his inauguration in August 2011. I salute parliamentarian Dawa Phunkyi for raising this issue in the last parliamentary session. Grilling the cabinet is one of your jobs when there is glaring discrepancy in their conduct, integrity, performance or lack of transparency. At this point, the CCP’s hand is hard to confirm but we will never know the truth until Sikyong comes clean on this. Being a public figure of the highest office, he must bare his financial secrets to the public. And the time is now! In all parliamentary systems, candidates must disclose all of their financial assets. So the Siykong should disclose how he was able to procure a quarter million dollars to pay his mortage just before he took office. The Tibetan public has the right to know who is twisting the arms of the Sikyong office behind the screen. There are at least 2000 Tibetans who have been living in US for more than 20 years and making more than $50,000 annually and yet majority of them don’t own a house or have not been able to clear the mortgage. Therefore, Sikyong’s claim in the parliament session that he spent 16 years in US and it was easy to payoff the mortgage does not hold much water. Fact is he spent the first part of his time in US as a student with no personal income. The Sikyong who was only a junior research assistant at Harvard University and was making less than $50,000 annually which is not at all a lot of money considering the daily expenses in dollars, not rupees. The fact that he got the inexpensive $227,000 house on mortgage in 2007 that is 12 years after he first stepped in to US speaks volume of the sheer difficulty of owning a house in a one-week time frame. The fact that his mortgage was cleared a week before he officially became Sikyong with the payment of just $1 raises more flags than one can imagine. I wish him prosperity but he cannot, as a responsible Sikyong, brush aside this genuine public concern. views in the article are that of the author, and doesn't reflect the stance of the news portal. Tibet Telegraph welcomes any article contribution as long as it is an interest to its readers, and a cause that its readers feel need to be addressed. i fail to see how the Tibetan Election Commission can be an objective referee when they are under the control of Gadhang Phodang and CTA. They could easily be pressured to exploit the electoral process. If I am right, that would means that there can never be a fair election in exile without the MiddleWay self interest muddying the water. Ultimately, it's about control. Controlling public opinion. TYC a non political party, self style champion of Human Rights and Democracy, playing politics happily margarnilizing political groups which they deem unworthy of their precious relationship, ironically the restriction don't apply to PRC. Maybe that is why our silkyong proudly lauds (to Tibetan audience) that we are a unified, party less democracy. So, what is the point of voting when the election process is rigged? Because, it looks good to the world and that is what counts, the real objective, to milk sympathy. What doctor Lobsang Sangay and those in exile power seem to be saying, dont pin your hopes for genuine democracy because a vibrant democracy is the enemy of Unity. 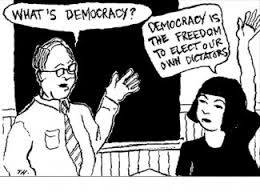 We say we have democracy because the powerful Western democratic nations expect us to have it but not because we really want it or need it. Right TYC stands pussified. Other NGOs will face the same fate had they got the guts to speak up in the first place. So few branches of TYC in those Tibetan concentration camps are usurping the power of the TYC executives in order to meet their own agenda. If they don't agree with TYC mission statement, why don't they quit TYC? These portos and mortos are not even Teens! What a joke CTA is bullying the exc of TYC for all to conform to their MW pipedream. Read the Phayul News, TYC shunned from Kalachakra social service opportunity due to independence? Serving the community is for a greater cause and CTA purposely deserting TYC to serve is really a dump stupid step. TYC did an amazing job in the past in that field so why not let them carry this services?